I know exactly what you mean. Sometimes I also do too much to a painting/drawing just to find out that it would have looked much better before and I remember that less is more. ;) Anyway, welldone. There's always gouache as a solution! 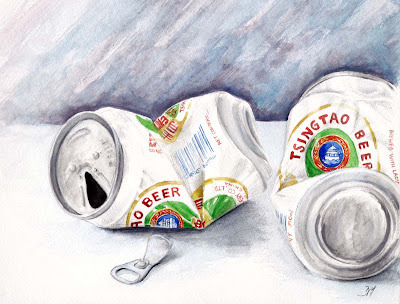 I think the background works just fine - the rich color makes it look like late in the evening, exactly the time when these cans would be emptied and forgotten :-) Great drawing! And so is the doughnut below - looks tasty! What a great painting! I actually really like the painted backdrop, I think it gives some nice depth to the overall picture. Thanks for your comments everyone, going to try again at some point, probably next time a beer can is left on my balcony. I've tried painting the bottles but never happy with the finished results.